WE'VE MOVED to Stratford, CT! Hooked on Fishing Charters offers private fishing charters out of Stratford CT. Captain Rick Dayhuff fishes Long Island Sound as well as the surrounding bays, harbors and rivers. The main targets are striped bass, bluefish, fluke, porgies, blackfish, false albacore, and bonito depending on season and availability. 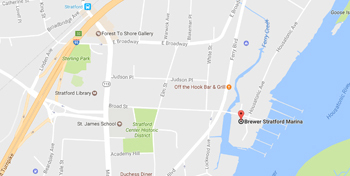 Hooked on Fishing Charters is conveniently located in Stratford CT, right on the Housatonic River, at Brewers Stratford Marina. Customize your fishing experience. We offer a variety of fishing charter trip options and are happy to help you book your ideal fishing experience. Find out more about our private fishing charter rates, what to bring to ensure a comfortable sport fishing trip, and the gear we use.